Two men face first-degree murder charges in connection with the discovery of a body in a vehicle south of Strathmore Sunday morning. In a statement, On March 17, Police were called to a location near the intersection of Highway 817 and Highway 22X shortly after 3:30 a.m.
Officers located a man who had succumbed to a gunshot wound inside a vehicle. 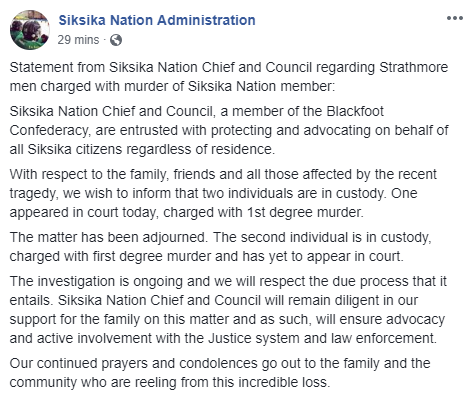 An autopsy conducted by the Office of the Chief Medical Examiner on Tuesday confirmed the identity of the deceased as 24-year-old Christian William White of the Siksika Nation. Kody Allan Giffen, 22 and Brandon Daniel Giffen, 25, both of Strathmore, have been charged with first-degree murder.